Disclosure: This post is sponsored by USFamilyGuide.com and Medieval Times. All opinions are my own. 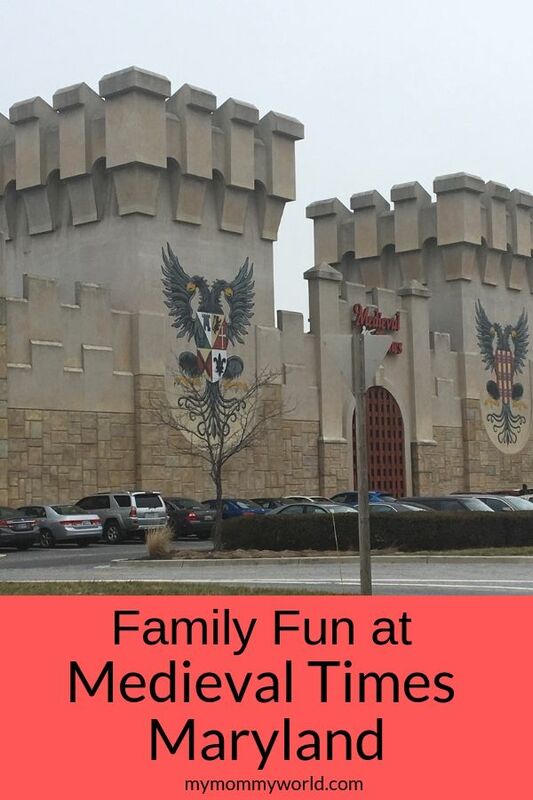 If you’re looking for things to do in Baltimore, Maryland that will please every member of your family, you need to get some tickets to the new show at Medieval Times Maryland. With heroic knights fighting with real swords to beautiful horses performing special tricks, all while you eat a hearty dinner, what’s not to love? Every member of our family enjoyed themselves at our recent visit there. Medieval Times is super fun dinner theater-style entertainment for the whole family. 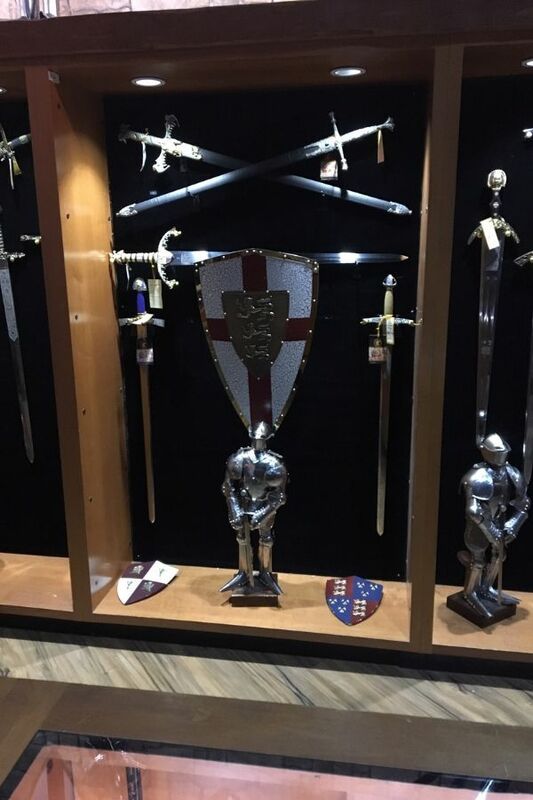 While you feast on a three course dinner, you are entertained by watching a tournament of knights who gather in celebration to test their skill against one another in a series of games, jousting, and combat. Real horses and even falcons participate in the show too, dancing (yes, the horses dance!) and jumping. Our family recently went to see their new show, led by Queen Dona Maria Isabella and her chancellor and lords. We arrived at the castle about 30 minutes before the show started, and were shown into the interior of the castle. They gave us a paper crown to wear…green, for the section in which we would be seated…and then we got our photo taken with a very realistically-sounding medieval lord. While waiting for the show to start, we browsed the souvenir counters. Medieval Times had lots of swords and shields on display around the castle, and some of them were available for purchase. There is also a bar inside the castle, where you can buy a drink to enjoy while you wait for the show to start. Tables and chairs were available to sit and enjoy drinks with your friends or family. About 10 minutes before show time, a group of trumpeters sounded their horns to get our attention, and the Queen’s assistant came out to tell us all the rules of the castle and then called us by color to head to our section of the dining room. Once we were seated…in rows that were set up stadium-style, perfect for being able to see the whole show with no problem…our server came over and explained how it was all going to work. In true serf language (everything is medieval themed!! ), he told us that our hero was the Green Knight and that we should cheer loudly every time he came out. But if we ever saw the Red Knight, well, he was our hero’s arch enemy, and should be booed whenever he came near. Then he told us how the food would work: we were to position our cups in such a way as to let him know whether we wanted Pepsi, lemonade or water. And he would serve us everything, whether we wanted it or not! The menu is fixed, and unless you have an allergy, which they asked us about twice, just to make sure, everyone gets the same thing. Surprisingly, my kids were fine with the arrangement and seemed to really enjoy their meals. I wish they were like this at home! We dined on soup (I think it was tomato bisque) and garlic bread to start, then moved to “roasted baby dragon,” (half a rotisserie chicken), a medieval French fry (half a roasted potato), and a piece of corn on the cob (no special name!). For dessert, we enjoyed a slice of lemon pound cake. The fun thing about dinner was that we ate it all with no knives, forks or spoons! Everything was done with your hands, which the kids thought was great fun. Large wet wipes were given to us at the end of the meal so that we could clean up. While we ate our feast, we were entertained by the Queen’s knights, falcon master and beautiful horses. First, we met the knights…6 in all…and then enjoyed a parade of the knights, their squires, and all the serfs and wenches. Our serf was out their holding a giant green flag in between serving us our soup and baby dragons! Next, we watched the falcon fly around the arena…literally over our heads!…and then catch, in mid-flight, a treat thrown to him by his trainer. It was beautiful! Then finally, it was time for the knights to show off their talents, which they did in the joust, the javelin and sword fighting. The knights used real armor, swords and shields, even sending sparks into the air at times when their swords clashed. My kids…my boy, especially…were cheering and yelling so loudly with excitement that I thought they might lose their voices. In the end, the evil Red Knight challenged our Green Knight to a final fight, and after several tense minutes, the Green Knight came out the victor! Our whole section was going crazy cheering, clapping and waving green flags for the hero. It was the best 2 hours of fun that we’ve had for a long time! Grab this Medieval Times Coupon for a Discount to their Newest Show! 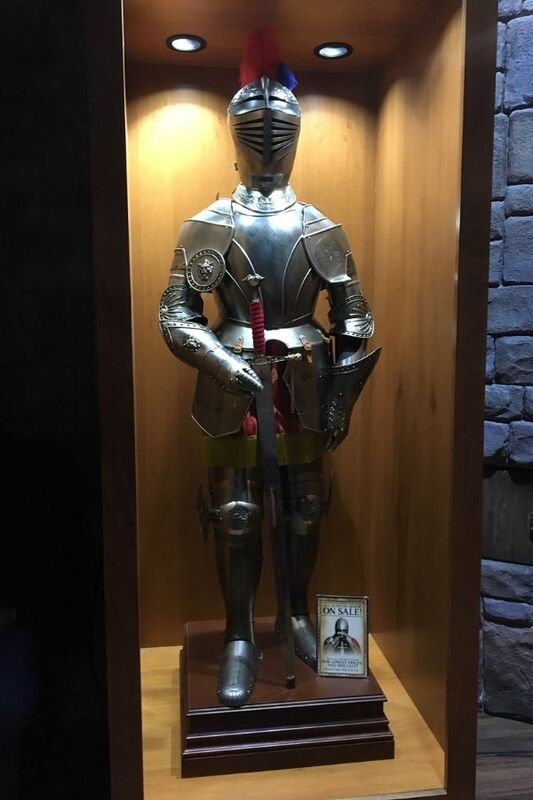 Would you like to take your family to experience the debut of Medieval Times’s new show? Use the coupon code USF37 to get tickets for only $37 at all castles through January 31, 2019. This is a great chance to be able to spend an evening with your family with a great dinner and entertainment rolled into one! Sounds like such a fun place to have dinner. Looks like you all had a good time. We love going to Medieval Times! One of my sons wants to go there for his birthday this year…we’ll see. Thanks for sharing, Erin! Medieval Times is such a great place to celebrate a birthday!